It seems we no sooner finish High Season than we begin planning for the next year. Our U.S. team has been busy making their biannual inspection trips, notebooks and iPads in hand and their clients on their mind. I’m planning a trip to gather information for our next Live Your Dream magazine, and have booked stays at the island’s two new 5 star hotels that we are pleased to represent, Le Barthélemy Hotel & Spa and Villa Marie Saint-Barth. I’ll also be looking at some exciting new villas to add to our portfolio, and meeting with some new chefs. Having a private chef prepare and serve an in-villa dinner is an experience that more and more of our clients have come to love. We think every villa stay is special, but having said that, do visit the Specials Offers page on our website. You’ll find some villas with significant discounts, complimentary rental cars to explore the island and other benefits like access to a fitness center. Take a look at the stunning pair of villas Naturelle 2 and 3. Villas participating in our popular Drive, Dine & Relax package are listed here as well, on the designated package page with full details. All are available with a minimum 7-day rental. 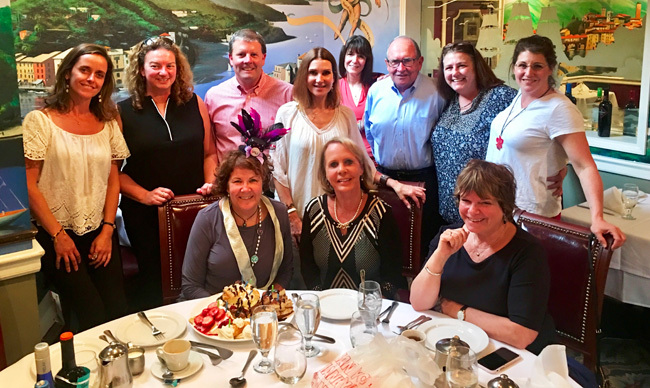 Our U.S team gathered for a fun lunch (tinged with a bit of sadness) in honor of Kathy Schlitzer’s retirement. We’ll miss her! However, we are delighted to have Allegra Pawlowski filling the void she leaves. 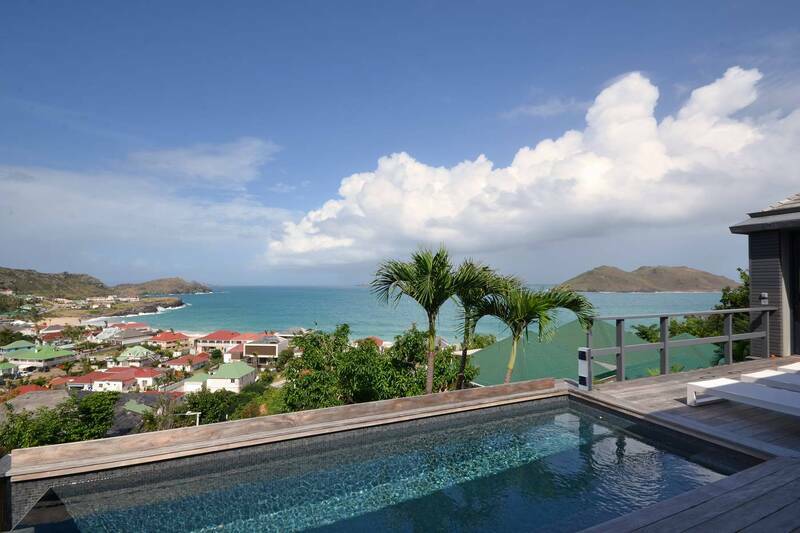 With her villa rental experience and passion for St. Barth she has “hit the island running.” She is currently onsite doing inspections. 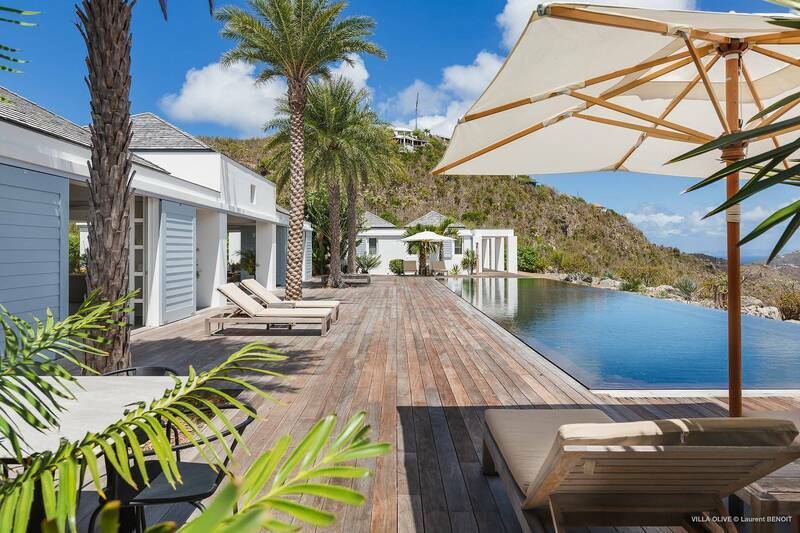 Villa and Hotel Specialist Julie Nally is just back from St. Barth. Please see Peg’s Blog for her trip report. St. Barth is known for its restaurants, including fine dining, classic French cuisine and chefs who work magic with the local fresh fish. But let’s be honest, there are nights we all crave pizza – and if we are vacationing with kids, it’s almost a must. Hideaway’s thin-crust pies are a perennial favorite, and Les Bananiers in Colombier has its own legion of fans. Plus there’s a brand-new option: Papa’s Pizza in St. Jean. In addition to their menu of yummy pizzas, they offer sandwiches, salads and a nice variety of main dishes for takeaway – and they deliver! Hillside in Flamands, this newly built contemporary 3 bedroom villa is within walking distance (though very steep) of Flamands Beach and boasts a stunning vista of its bay. Air-conditioned throughout, the indoor living spaces are expansive and leverage the view. The sleek kitchen has an island. There are two master suites, one in the main house off the living area and one in a separate poolside pavilion. A lower-level guest bedroom also has an en suite bath andthere is a guest bath. I just wanted to write and let you know that we had an AMAZING time. The hotel (Le Barthélemy) is fantastic – they've done a great job, and I wouldn't look to stay anywhere else going forward. Your guides and guidance were invaluable, and we referred to them constantly.